A team of retired CIA agents take on the Agency to find out who's trying to kill them. Made for if you're in the mood for a brainless action comedy then maybe you'll like it. Rated PG-13 for intense sequences of action violence and brief strong language. Frank Moses (Bruce Willis) spends his days, now that he’s retired from the CIA, waiting for his pension checks to arrive. He likes talking on the phone with his pension representative Sarah Ross (Mary Lousie-Parker). He’s become fond of her, but someone’s always listening even though Frank has been out of the game for quite a while now. “They” can tell he’s getting a bit too friendly with Sarah, and for some reason which isn’t quite known, they’ve got to put a stop to it and fast. Enter a small force of special agents dressed in black riot gear that mow down Frank’s house with hundreds of thousands of rounds of automatic fire, but like any action movie hero, Frank is impervious to automatic ammunition. Frank narrowly escapes. Now he knows that not only is he not safe, but Sarah isn’t safe either. In order to help Sarah and find out exactly who is doing this to him, and why, he enlists the help of his old team (and I stress the word ‘old’). 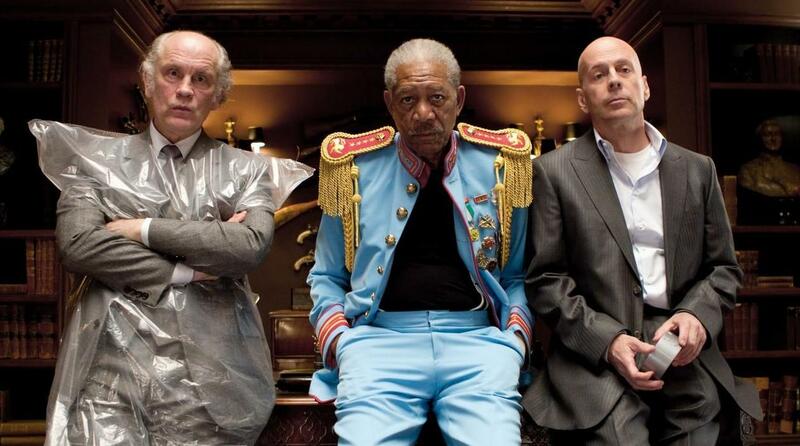 Joe Matheson (Morgan Freeman) is living it up in a retirement home. Victoria (Helen Mirren) enjoys flower arranging, but still takes the odd contract on the side just to keep up to date with the way assassinations are carried out. Marvin Boggs (John Malkovich) has lost his mind and now lives in the middle of nowhere, paranoid that satellites are scanning his brain at all times. Freeman is always great at playing the laid back member of a team of killers, remember his smooth personas in Wanted or Lucky Number Slevin? Malkovich has crazy written all over him, and plays that role perfectly, with a finesse that other actors could only dream of having. Mirren is just about the only actress that could pull off playing the regal Queen Elizabeth II in one movie and then turn around and play a ruthless assassin for hire in another movie. She’s always believable no matter what role she takes on. Seeing Helen Mirren unload large caliber, automatic fire on SUVs is funny and frightening at the same time. Frank Moses must pull off his own Mission Impossible plan and break into the secret basement of the Pentagon to find out exactly how deep this conspiracy goes. There’s always a deeper conspiracy in these types of films isn’t there? The problem with Red (which stands for ‘Retired: Extremely Dangerous’) is that it’s too by-the-books when it comes to an action movie with political intrigue. It even has the requisite shipyard shootout and the abandoned warehouse showdown. Much of the talent you see on screen is wasted with a run-of-the-mill script and moments that seem cut and pasted from hundreds of other action movies that have gone before. With this cast you might be expecting a wow-moment of an action thriller. Sadly, you only get a mirror image of action movies you’ve seen before, only this time you may find the main characters at your local Denny’s ordering the Early Bird special with their senior citizen discount.